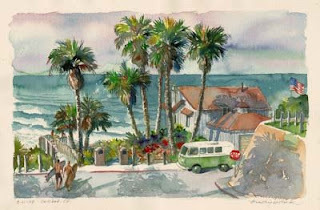 An opportunity to paint again in the strong sunlight and coastal fog, I love to paint in San Diego North County. 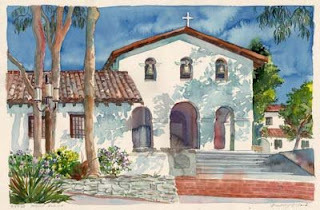 Part way through the trip, my daughter, seeing the group of paintings develop, said I should include architecture more often. 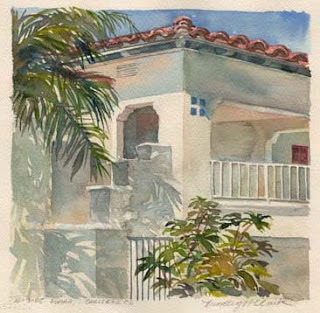 Looking for architecture and continuing to think more about composition, while pushing the wet effects of watercolor, I felt like I was developing some momentum. I was commissioned to do a couple of home portraits this month. When working on site, I also take a few photos. 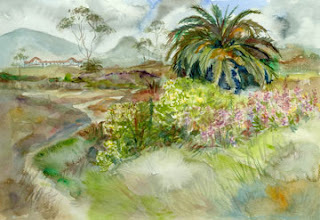 After I return to my studio and give the paintings a rest for a few days I use the photos to adjust the values a little. 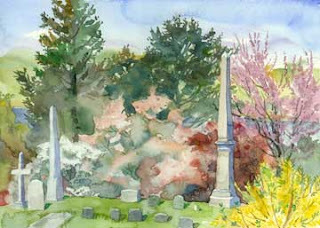 For the past couple of weeks I have been painting locally at a beautiful cemetery in Poughkeepsie NY. It has a wonderful variety of spring blooming trees. From the top of one hill is a sudden spectacular view of the Mid-Hudson Bridge and the old train bridge which has been slated to become a pedestrian walkway park. I also painted on a quick road trip with my son in central NY and PA. The linen-bound watercolor notebooks I mentioned in a previous post. Before heading to Utah to paint with friends, I had a few days with family in California. 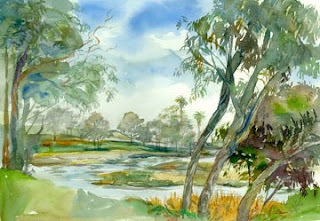 These paintings were done near homes of relatives. It always takes 30-60 minutes to find the spot I want to paint, I try to do each on site painting in 2-3 hours, sometimes less. I use my fingers as a view finder and compose an image which always seems to change when it gets on paper. I believe this will resolve with my recent efforts to make a pencil value study in a separate sketchbook before I begin the watercolor. 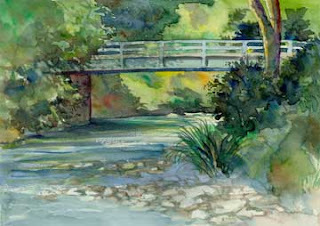 Frequently I take a photo or two, thinking I will use it to finish the painting in the studio if needed. I seldom use them later. The painting is always so different from the photo that they are not really useful. I have to make decisions on site about composition, value and color. The photo may influence me to adjust the values a little. The camera does help as a viewfinder aid unless I am painting a format which is completely different from the photo format. 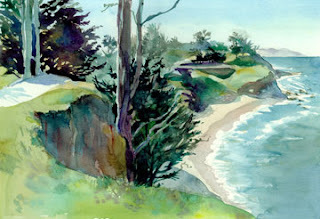 I find my favorite format for plein-air landscapes is a very long horizontal. My current sketchbook is a more standard horizontal. 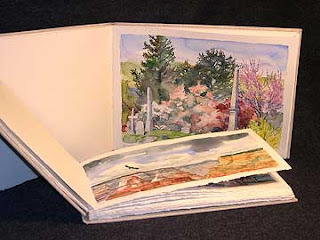 I have been working for a couple of years in linen bound watercolor sketchbooks. At first it was intimidating, but it also makes me take each painting session seriously and bring all my focus and skill to each effort. The dilemma is what to do with the failures that are bound together with the successes. While traveling in California, Nevada, and Utah in early April I was paying more attention to pre-painting composition studies than usual. 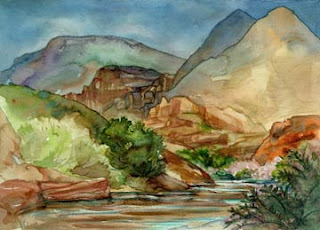 Brad Teare, Ken Harris and I painting together in Snow Canyon near St. George, Utah and at the Thunderbird Ranch (Maynard Dixon's home & studio http://www.thunderbirdfoundation.com ) in Mr. Carmel, UT. Deliberately painting with other painters was a first. I like painting alone but wanted to paint with someone for the critique and analysis that would happen. 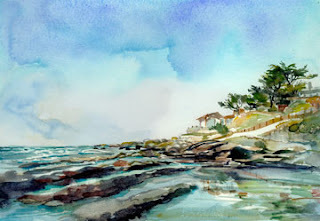 I had watched a DVD about painting outdoors (in oils) with a focus on composition before the trip and I found that it made me paint differently. I did pre-paint pencil value/composition sketches for the first time. I found I was painting much less loosely and with less confidence. I was trying to see the scenes and capture them through the eyes of an oil painter. By the end of the trip, I realized I should keep up the value sketches, but paint with more freedom and confidence in my watercolors. We were only together for three days and only did two full paint sessions. It was not enough. 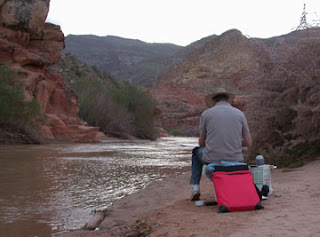 There is a vast variety of amazingly paintable scenery in So. 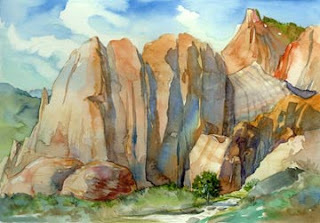 Utah and we plan to meet again next year and paint together longer. I was now really enjoying myself and decided to paint outdoors daily. 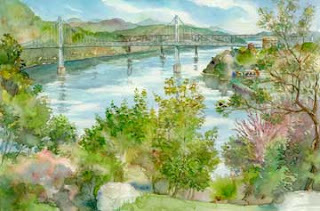 That summer, the family had an extended trip planned to visit family in several western states and I committed to paint daily. 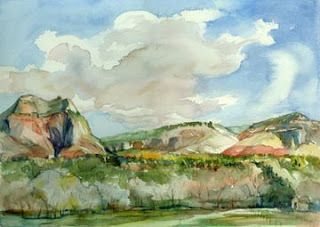 I came home with 43 plein-air watercolors. I am lucky to have a portable career that allows me to take all my supplies in a suitcase and set up studio on available table space at the homes of family and friends or at the hotel. I had illustration assignment work to complete during that month and a half and would set up my workspace for a week or so at our parents or if a deadline was close I would work for a day or two at our host's while my family did summer stuff. It is a great way to go away for extended time and still meet my deadlines and make a living. 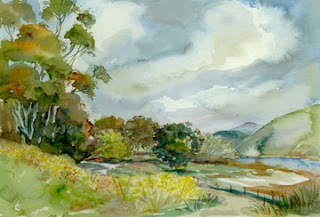 The assignment work would be sent to the client and the new plein-air paintings were traveling with me so I could review what I was learning and where we had been. 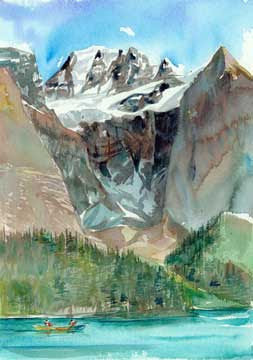 One of the great benefits of these paintings now is that I can relive that wonderful trip by looking at those paintings. I had a huge scare upon my return home when we unpacked and the paintings were gone. I had put all of them together in a portfolio and hand-carried them on the plane but left them in the airport men's room when we landed at Newburg NY. Our youngest was only 4 years old and I was carrying too much gear, but I ran back to the airport the next day and got my precious portfolio. 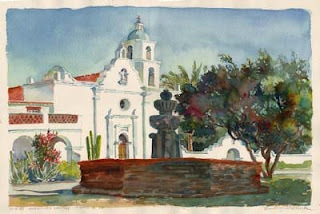 I began painting plein-air in 1992. 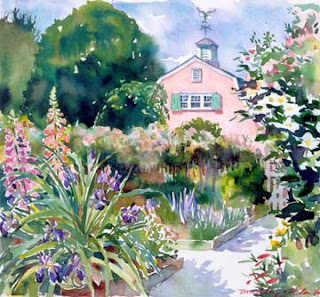 In 1991, I illustrated a map of a private Connecticut garden from photographs for "Homes and Gardens Magazine" and after publication the owner of the garden contacted me to see if I would consider painting from life in her garden. I tried, failed, and then began practicing the next spring at a beautiful local nursery owned by friends in Rhinebeck, NY, Northern Dutchess Botanical Gardens. 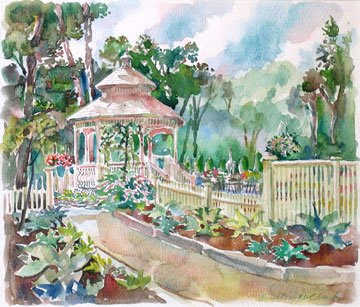 After a few weeks I felt more confidant and I tried again at the garden in Connecticut with great success and have been an avid plein-air painter ever since.